Graphics Converter Pro 2009 is an easy-to-use and powerful batch graphics converter and image viewer, that can import more than 500 graphic formats and export more than 100 formats including BMP, GIF, JPG, PNG and many others. The program comes with 50 image filters and 12 image effects and more. Graphics Converter Pro 2009 for Vector supports many vector graphic formats. Now version 2009 supports the conversion between PDF files and hundreds of graphic formats. Graphics Converter Pro 2009 for vector contains all functions of Graphics Converter Pro 2009. Exclusively, it supports 22 vector graphic formats conversion. Graphics Converter Pro is a powerful batch graphics converter and picture viewer. Graphics Converter Pro can import more than 500 graphic file formats, including BMP; DIB; EMF; GIF; ICB; ICO; JPG; PDF; PBM; PCD; PCX; PGM; PNG; PPM; PSD; PSP; RLE; SGI; TGA; TIF; TIFF; VDA; VST; WBMP; WMF; VST; CEL; PIC; PDD and more. Graphics Converter Pro can export about 100 formats, including BMP; GIF; JPG; PNG; TGA; TIF; WMF; EMF; WBMP; RGB; BM; RPPM; RPGM; PCC; DCX; RPBM; PIX; BPX; VDA; ICB; VST; WBM; WAP; JIF; RL4; TIM and more. Graphics Converter Pro it also has a capture tool and an easy-to-use slide show utility. · Support more than 500 graphic formats, and Graphics Converter Pro 2000 for vector supports 22 vector formats, including CGM, DGN, DWF, DXF, DWG, GBR, PCT, PLT, WMF and more. For more details, please read list of 500 supported formats. · Offer 12 image effects, including Flip, Wave, Noise, Arbitrary Rotation, and more. · You can save your selected filters or effects as default set, and apply them in a batch processing. · Support batch conversion from PDF files to hundreds of graphic formats, such as JPG, GIF, PNG, TIF and so on. 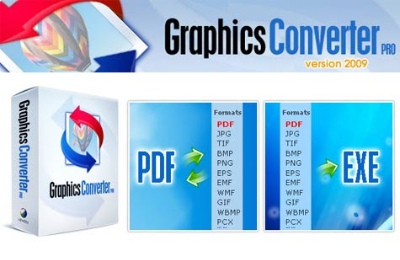 · Hundreds of graphic formats can be converted to PDF in batch. Merge various kinds of graphic files or PDF files to a single PDF file. What's new in Graphics Converter 2009? a. Support batch conversion from PDF files to hundreds of graphic formats, such as JPG, GIF, PNG, TIF and so on. b. Hundreds of graphic formats can be converted to PDF in batch. Graphics Converter Pro 2009 for Vector also can convert vector images(such as DWG, CGM, DGN, DWF and etc.) to PDF. c. Merge various kinds of graphic files or PDF files to a single PDF file. d. Easily split a multi-page PDF file to single-page PDF files(1 page to 1 file). - Offer 60 image filters, including Blurring, Sharpening, Embossing, Diffusing, Color Balance, and more. - Offer 12 image effects, including Flip, Wave, Noise, Arbitrary Rotation, and more. - You can save your selected filters or effects as default set, and apply them in a batch processing. To unsubscribe from this group, send email to itexim+unsubscribe@googlegroups.com. For more options, visit this group at http://groups.google.com/group/itexim?hl=en. sign making supplies, digital media services and advice. [computer-tech-support: 8247] Fwd: Paper feeding problem and quality printout problem. Subject: Paper feeding problem and quality printout problem. I have a Samsung SCX-4100 series Laser printer with scanner. My problem is that the printer is not taking the paper automatically during printing. I have to feed the paper manually. What is the problem and please tell me the step by step method to repair it. The print quality is also very poor. The prints are faded ones. What I have to do to get good quality printouts?. To unsubscribe from this group, send email to computer-tech-support+unsubscribe@googlegroups.com. For more options, visit this group at http://groups.google.com/group/computer-tech-support?hl=en. The Targus Chill Hub XC for Laptops is designed to keep your laptop cool and protect your workspace from heat damage while providing 4 USB ports for peripherals. The dual USB powered fans provide unsurpassed cooling and help prevent the laptop from overheating. It also acts as a heat barrier and provides a stable work surface when using your laptop on your lap. [computer-tech-support: 8246] Paper feeding problem and quality printout problem. [eZonFUN] Fwd: The Worlds 15 Most Beautiful Gardens!!! Zedomax - The DIY, HOWTO, Mod, Hacks, Gadgets, and Tech Blog!